Sanjaya said, "Beholding the mighty and terrible array called Krauncha formed by Pandu's son of immeasurable energy, thy son, approaching the preceptor, and Kripa, and Salya, O sire, and Somadatta's son, and Vikarna, and Aswatthaman also, and all his brothers too, headed by Dussasana, O Bharata, and other immeasurable heroes assembled there for battle, said these timely words, gladdening them all, 'Armed with various kinds of weapons, ye all are conversant with the meaning of the scriptures. Ye mighty car-warriors, each of you is singly capable of slaying in battle the sons of Pandu with their troops. How much more then, when ye are united together. Then Bhishma and Drona and thy sons, O sire, formed a mighty array for resisting that of the Parthas. 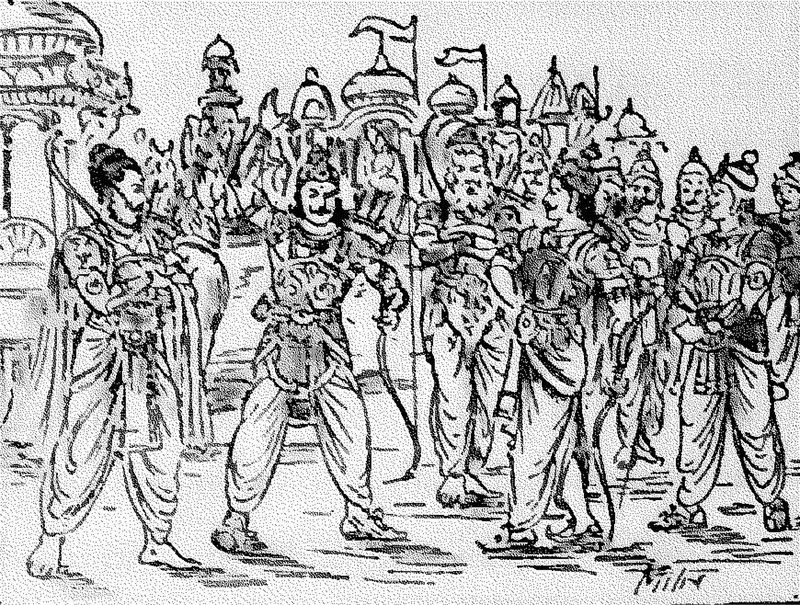 And Bhishma, surrounded by a large body of troops, advanced, leading a mighty army, like the chief of the celestials himself. And that mighty bowman, the son of Bharadwaja, endued with great energy, followed him with the Kuntalas, the Dasarnas, and the Magadhas, O king, and with the Vidarbhas, the Melakas, the Karnas, and the Pravaranas also. And the Gandharas, the Sindhusauviras, the Sivis and the Vasatis with all their combatants also, (followed) Bhishma, that ornament of battle, and Sakuni, with all his troops protected the son of Bharadwaja. 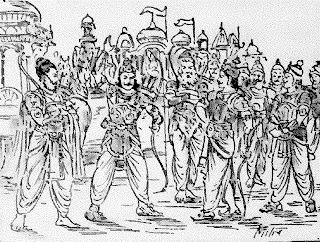 And then king Duryodhana, united with all his brothers, with the Aswalakas, the Vikarnas, the Vamanas, the Kosalas, the Daradas, the Vrikas, as also the Kshudrakas and the Malavas advanced cheerfully against the Pandava host. And Bhurisravas, and Sala, and Salya, and Bhagadatta, O sire, and Vinda and Anuvinda of Avanti, protected the left flank. And Somadatta, and Susarman, and Sudakshina, the ruler of the Kamvojas and Satayus, and Srutayus, were on the right flank. And Aswatthaman, and Kripa, and Kritavarman of Satwata's race, with a very large division of the troops, were, stationed at the rear of the army. And behind them were the rulers of many provinces, and Ketumat, and Vasudana, and the powerful son of the king of Kasi. Then all the troops on thy side cheerfully waiting for battle, O Bharata, blew their conches with great pleasure, and set up leonine roars. And hearing the shouts of those (combatants) filled with delight the venerable Kuru grandsire, endued with great prowess, uttering a leonine roar, blew his conch. Thereupon, conches and drums and diverse kinds of Pesis and cymbals, were sounded at once by others, and the noise made became a loud uproar. And Madhava and Arjuna, both stationed on a great car unto which were yoked white steeds, blew their excellent conches decked with gold and jewels. And Hrishikesa blew the conch called Panchajanya, and Dhananjaya (that called) Devadatta. And Vrikodara of terrible deeds blew the huge conch called Paundra. And Kunti's son king Yudhishthira blew the conch called Anantavijaya, while Nakula and Sahadeva (those conches called) Sughosa and Manipushpaka. And the ruler of Kasi, and Saivya, and Sikhandin the mighty car-warrior, and Dhrishtadyumna, and Virata, and the mighty car-warrior Satyaki, and that great bowman the king of the Panchalas, and the five sons of Draupadi, all blew their large conches and set up leonine roars. And that great uproar uttered there by those heroes, loudly reverberated through both the earth and the welkin. Thus, O great king, the Kurus and the Pandavas, both filled with delight, advanced against each other for battling again, and scorching each other thus." 359. This identical verse occurs in the first chapter of the Bhagavad Gita (vide, Verse 10, Chap. 25, of this Parvan, ante). There following the commentators, particularly Sreedhara, I have rendered Aparyaptam and Paryaptam as less than sufficient and sufficient. It would seem, however, that that is erroneous. 360. For these names, vide note in page ante, Bhishma Parva.